While the current financial crisis has compromised local authorities’ ability to deliver municipal services, the Localism Act adopted in England in 2011 seeks to relieve the problem by encouraging greater involvement from civil society. However, when combined with drastic public spending cuts, this reform above all threatens to sideline citizens in favour of the private sector. One of the first acts of the Conservative–Lib Dem coalition that came to power in the UK in 2010 was to bring in local-government reform, in the shape of the Localism Act. This law, passed in November 2011, proposes to introduce more “localism” into the management of municipal services. Localism, in the British political context, refers to a political ideology that encourages citizens to participate in the creation and implementation of local policies,  and which promotes the management of collective services at neighbourhood level. This article will look more closely at two aspects of this law: the promotion of participatory planning, and the ways in which “Big Society” can be involved in the management of local services. As things stand, citizen empowerment is patchy, to say the least, and even runs a risk of restricting access to services, which is already highly variable, depending on the geographical context. In well-off rural areas, a transfer of powers to civil society appears to be broadly feasible, thus safeguarding access for as many people as possible. In urban areas, on the other hand, and London in particular, this reform seems to herald the privatisation of municipal services and the exclusion of the most underprivileged populations. The Localism Act – long awaited by public bodies in favour of participatory planning – enables residents, businesses and retailers in a given area to join forces to create a “neighbourhood forum”. These forums have the power to recommend planning permission (“neighbourhood development orders” or “community right-to-build orders”) and propose local area plans (“neighbourhood plans”). The initiative, inspired by rural management models, has struggled to take off in the capital. Only a dozen pilot forums have so far been approved in London (out of 200 approved nationwide ). In gentrified areas (such as Bankside, Bermondsey and Kentish Town), where levels of social and cultural capital are high, as well as in wealthy neighbourhoods (e.g. Kensington, Ealing Broadway), they have been led by residents’ and retailers’ associations. By contrast, in the case of urban regeneration operations (e.g. Hackbridge), they have been set up by borough councils, making it easier to build consensus before projects get under way. “Big Society”: can civil society take over municipal services? The Localism Act also makes it easier for bodies other than local authorities to take charge of municipal services. This aspect of the law has been implemented in a context of significant budget cuts, which have fallen particularly heavily on local authorities. Under Thatcher, the withdrawal of state funding was justified by a denial of the very existence of society: “[S]ociety? There is no such thing!”  Today, the Conservative Party considers that these cuts are justified because it is the responsibility of “Big Society” to manage local services. The ideology may be different, but the effects on local-authority budgets are the same. Local responses to budget cuts depend to a large extent on the socio-economic characteristics of the populations concerned and local associations’ ability to take over threatened services. In this respect, the geographical distribution of budget cuts  has disproportionately affected areas that were already vulnerable. In well-off rural areas, cuts in operational funding have been much lower than in urban areas. And, as rural areas already benefited from an extensive network of representative structures at sub-district level  (Civil Exchange and Democratic Audit 2012), they have shown greater resilience in the face of cuts. The voluntary sector, despite being highly active in the capital, is far too fragmented and lacks experience in managing services, and is thus ill suited to take the place of cash-strapped borough councils (Travers 2011; Wills 2012). And indeed it, too, has been a victim of budget cuts. Added to this is the inherent complexity of a major metropolis, linked to mobility, social and ethnic diversity, and the economic challenges associated with transport infrastructure projects and major urban (re)development programmes. Consequently, it is not easy for the “civil society” element of “Big Society” to take charge of municipal services. This therefore opens the way to intervention from the private-sector, which sees these services as new markets to be conquered in these times of economic crisis. The specificities and complexity of the context in London raises the question of whether the conditions are truly appropriate for a wholesale transposition of practices in rural areas, where there exists a dense network of non-governmental civil institutions to back up local government. Surely metropolitan contexts call for different management methods and different democratic processes? The spectre of increased privatisation of urban services and, as a result, the transformation of user-citizens into customers, at the expense of political exclusion, is the flip side of what appears to be participation. With this reform, Londoners will ultimately benefit only from a limited involvement in urban planning decisions. Yes, they will be given greater responsibilities for running local services, but in exchange for increased abandonment (Clarke 2005). Appert, Manuel and Drozdz, Martine. 2010. “Conflits d’aménagement aux marges nord-est de la City de Londres”, Hérodote, vol. 137, no. 2, pp. 119–131. Civil Exchange and Democratic Audit. 2012. The Big Society Audit, London: Joseph Rowntree Charitable Trust – Calouste Gulbenkian Foundation. Clarke, John. 2005. “New Labour’s Citizens: Activated, Empowered, Responsibilized, Abandoned?”, Critical Social Policy, vol. 25, no. 4, pp. 447–463. Conservative Party. 2010. Open Source Planning Green Paper. Department for Communities and Local Government (DCLG). 2012. Localism Act: Neighbourhood Plans and Community Right to Build. Impact Assessment, London: DCLG. UK Parliament. 2011. Localism Act 2011 (c. 20), London: The Stationery Office. Powell, Martin. 2004. In Search of New and Old Localism, Oxford: ESPAnet Conference Proceedings. Travers, Tony. 2011. Engaging London’s Communities. 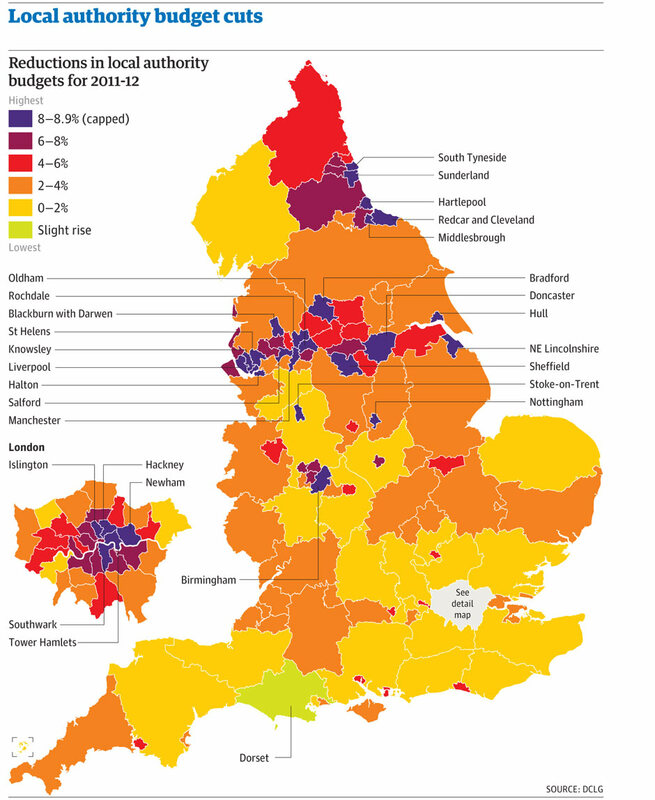 The Big Society and Localism, London: London Councils. Wills, Jane. 2012. “The Geography of Community and Political Organisation in London Today”, Political Geography, vol. 31, no. 2, pp. 114–126. The Localism Act comprises 10 parts in all. Of these, four are devoted to the prerogatives and autonomy of local authorities (Parts 1, 2, 3 and 4), one to the governance of London (Part 8), one to the involvement of local residents in the running of municipal services (Part 5), and one to planning (Part 6). The unequivocal promotion of localism by British governments can be traced to Tony Blair’s first term as prime minister, and more generally to the ideological reconfiguration of (New) Labour on the subject of local government. Blair’s 2001 speech titled “Improving your local environment” (http://webarchive.nationalarchives.gov.uk/20061004085342/number10.gov.uk/page1588) played a significant role in this ideological change, which placed responsibility for improving local conditions on the area’s residents. “[W]e need a thoughtful re-imagination of the role, as well as the size, of the state. (…) Our alternative to big government is the big society.” Speech by David Cameron titled “The Big Society”, 2009 (www.conservatives.com/news/speeches/2009/11/david_cameron_the_big_society.aspx). “Neighbourhood development plans (instigated by a neighbourhood forum or town/parish council that is advised and supported by the local planning authority) that are in general conformity with the strategic policies of the local development plan for the local area (...) and have appropriate regard to national policy have statutory weight and decision-makers will be obliged to make decisions on planning applications for the area that are in line with the neighbourhood development plan” (DCLG 2012). For a geography of neighbourhood forums at national level, see the maps of pilot forums in England, at the following addresses: https://maps.google.co.uk/maps/ms?msid=214017557671758190387.0004ba44f03a2d2b4e3e4&msa=0 and https://maps.google.co.uk/maps/ms?msid=201745166119078231783.0004a5212936814f906d1&msa=0&ll=52.762892,-2.021484&spn=10.274404,19.753418. As mentioned in the explanatory notes to the Localism Act, “A key element of the Bill is to provide for community empowerment with powers (...) to express an interest in running local authority services” via the Community Right to Challenge procedure. See the graphic produced by The Guardian, available at the following address: http://static.guim.co.uk/sys-images/Guardian/Pix/pictures/2010/12/14/1292322459574/Council-cuts-graphic-008.jpg. Civil parishes, each with a parish council or (if the parish has town status) town council. As indicated by Tony Travers in the report commissioned to measure the extent of “Big Society” in London: “Interviews conducted for this project suggested a lack of enthusiasm among leaders, mayors and chief executives for the development of parishes in the capital.” (Travers 2011). The “English indices of deprivation” or “multiple deprivation index” is a composite indicator that measures exclusion. For the population of each neighbourhood in England (defined in terms of census areas at sub-ward level), this indicator combines measurements of access to certain services (healthcare, education, training, environmental amenities, housing, crime prevention) with data concerning their levels of education, skills and training, their access to employment and their income levels. In particular, neighbourhood libraries. A list of libraries run by volunteers since the implementation of budget cuts can be found here: www.publiclibrariesnews.com/about-public-libraries-news/news-topics. The local services currently most at risk in London are: legal aid (free legal advice for people on welfare benefits, people in debt, foreigners and women who are victims of domestic violence); English lessons for new arrivals to the UK and literacy classes; social services for the long-term unemployed and young adults; cultural and leisure centres for young people; pre-school childcare services; and the maintenance of highways and street furniture. Sources: see The Guardian’s “Cutswatch” pages, where readers can report local budget cuts (www.guardian.co.uk/society/cutswatch?page=12), the reports commissioned by the Trust for London (www.trustforlondon.org.uk) regarding assistance services for women who are victims of domestic violence (www.trustforlondon.org.uk/VAWG%20Full%20report.pdf), and access to legal aid for foreigners in London (www.lag.org.uk/media/47814/london_advice_watch_report.pdf). Information relating to other services results from interviews conducted with associations and local authorities since 2010. “A community-based version of a business improvement district would appear to offer a possible way forward (...). The idea would be to create ‘community improvement districts’ (CIDs) that were (...) capable of raising resources [to deliver a service or run a facility]” (Travers 2011).